is honored on Panel 1W, Line 66 of the Vietnam Veterans Memorial. The entire extended Ryder / Schell family back in the Philadelphia area will never forget and are honored and humbled by David's service to our country. Although my grandmother Lillian Ryder kept in touch with his mom Gertrude and my own mom his aunts , I was way to young to have known Lt Thompson growing up in Allentown. So we will keep David's memory alive in our families now. We will never forget him and will always visit the memorial when we are in Washington DC. 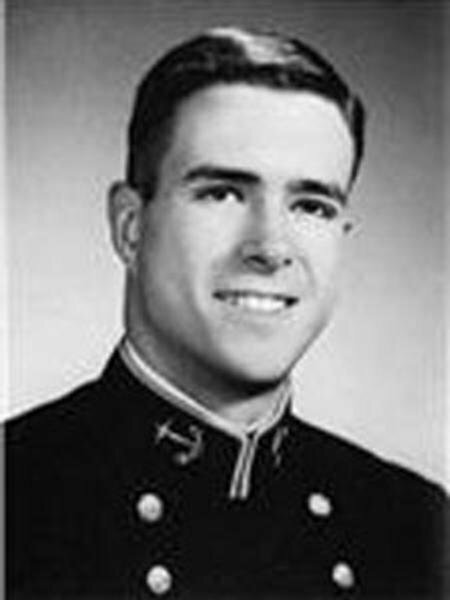 If I should die...remembrances for LT David Matthew THOMPSON, USN...who made the ultimate sacrifice! If I should die, and leave you here awhile, be not like others, sore undone, who keep long vigils by the silent dust, and weep...for MY sake, turn again to life, and smile...Nerving thy heart, and trembling hand to do something rto comfort toher hearts than thine...Complete these dear, unfinished tasks of mine...and I, perchance, may therein comfort you. 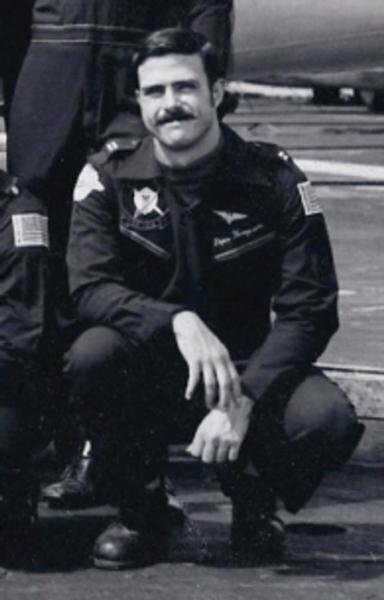 This is a cropped picture of Lt. Thompson from a VF-24 squadron photo taken in the summer of 1972. For LT David Matthew THOMPSON, USN...another of Pittsburgh's bravest of heroes, who gave his all!!!! Every day, in a hundred waysm, he told us so. Every day, in a hundred ways, he showed us so. He took an oath top guard us, and fought for liberty! Lieutenant Thompson, you had given all that mortality can give! You sailed into harm's way to defend liberty everywhere! You had been there and done that, flying F8U Crusader fighters in the Gulf of Tonkin and over North Vietnam to enhance the cause of freedom! You were one brave man who did brave deeds for our America! You were one of Pittsburgh's...and America's...bravest of knights, who fought for the right, without question or pause! Your name and fame are the birthright of EVERY American citizen! In your youth and strength...your love and loyalty...you gave all so that freedom and justice may live! You had brought honor to Pittsburgh, the home of heroes BRAVE AND TRUE!...yes, to the city where three rivers meet...to the home of the BUCS and the STEELERS! You had lived up to the code of conduct and chivalry of those who guard this beloved land!...an ideal SO NOBLE that uit arouses in all of us a sense of pride, and yet, of humility! I strongly believe that Jill Corey, whom Avonmore (her home town) and Pittsburgh (where she got her start) can claim as one of their own, and whom I greatly admire as one of my three top favorite songbirds of all time, which includes Julie Andrews, England's grande dame opf music, and another thrush from England, Dusty Springfield, who passed on some years ago, would be very proud of your service to America, and the sacrifices made by you to kweep out country free! You are still our hero, Lieutenant! Well done, Sir! Be thou at peace. SAIL ON!!!!!!!!!!!!!!!!!!!!!!!!!!!!!!!!!!!!!!!!!!!!!!!!!!!!!!!!!!!!!!!!!!!!!!!!!!!!!!! !